When a researcher read a history book last summer, he was struck by the similarities between how cancer and insurgencies evolve over time. 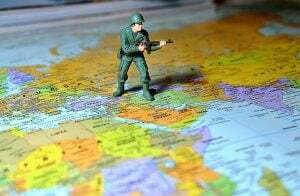 Could military strategy be used as inspiration for cancer treatment? He and colleagues are on a mission to find an entirely novel approach to his field. ‟There are actually a great number of similarities between the US Army’s field manual on how to counter insurgencies, or COIN doctrine, and cutting edge thinking in cancer treatment,” says David Gisselsson Nord, a pathologist and cancer researcher at Lund University in Sweden. A core principle is that you don’t succeed simply by defeating the enemy; you also have to win the trust and loyalty of the local population – by addressing the root causes of the insurgency. ‟A British field marshal, Sir Robert Templer, expressed it this way: ‘The answer lies not in pouring more troops into the jungle, but rests in the hearts and minds of the people’,” explains Robert Egnell, a strategist at the Swedish Defence University in Stockholm. Both cancer and insurgencies are complex systems of many different cells, or groups, interacting. Initially, they may both seem easy to defeat: the bulk of a tumour, a so-called major clone, is successfully treated with a high dose of chemotherapy and shrinks dramatically, or even goes away. Similary, using armed force against a guerilla can quell a major rebellion at first. There are still small genetic variants of cancer cells – or subclones – that remain throughout chemotherapy. They become resistant to treatment, and when they are no longer suppressed by the major clone, the tumour can either regrow locally or metastasize in a different part of the body. In the same way, underground paramilitary movements that aren’t easy to detect can surface in the power vacuum following an intervention. They can be unpredictable, and may appear in the same province as before, or pop up in other areas. “Could we target the microenvironment of a patient so it doesn’t support cancer? How do we harness the patient’s own resources? There has been some success with immunotherapy, that is, using the body’s own immune system to fight cancer. I believe there is more that could be done. Currently, we simply know too little about the host cells that allow certain cancer cells to survive and cause relapses,” says David Gisselsson and Robert Egnell. A summarising tactical brief from the COIN doctrine is: shape, clear, hold, build. Shape the environment to hinder insurgencies (shape), implement a military intervention (clear), then temporarily take over responsibility for the nation (hold), only to finally rebuild the country in a sustainable manner (build). Analogous to COIN doctrine, in certain cases the focus could be on keeping the cancer in check (hold), thereby dealing with a more stable disease which responds to treatment. ‟ One way of achieving this, in theory, is to treat the tumour in such a way as to maintain the biodiversity of the main tumour, so that new types of cancer cells which are untreatable do not take over. Such strategies have rarely been investigated,” David Gisselsson Nord explains. In addition, increasing numbers of studies show that physicians need to repeat biopsies and double-check biomarkers to enable continuous modification of treatment and prevent the cancer from becoming resistant. It is increasingly clear that, in most forms of cancer, the tumour’s genetic code changes over time. In order to keep up with the unpredictable growth of the insurrection of cancer, the warfare must be intelligence-led and flexible. Fighting a guerrilla exclusively with military means, or conducting civil activities which are not specifically adapted to the surrounding political and social context, is doomed to fail according to Robert Egnell. “Physicians need to become better at the clinical ‟intelligence workˮ so that medication can be adapted to changes in the tumour’s properties, because a tactic that works for one patient today does not necessarily work a few months away for the same patient,” concludes David Gisselsson Nord.